A Cornish town council is to uncover a bust of Isambard Kingdom Brunel as part of the celebrations to mark the 200th anniversary of his birthday next April. The sculpture of the Victorian engineer is currently hidden behind bushes at the Saltash end of the Tamar Bridge. The bridge runs alongside one of his greatest creations, the Royal Albert railway bridge spanning the river. Saltash Town Council plans to clear the bushes and lay turf so Brunel has a clear view of his masterpiece. The bust will also be floodlit so it can be clearly seen at night by drivers crossing from Devon into Cornwall. The Royal Albert Bridge was designed by Brunel for the Cornwall Railway Company. It cost £225,000 and was officially opened in 1859 by Prince Albert. In 2003, £2m was spent on essential work to restore the historic bridge to Brunel's original design. 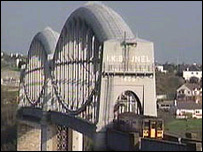 The bridge is known as the "Gateway to Cornwall" and is considered by many to be one of Brunel's most outstanding works. Isambard Kingdom Brunel died at the age of 53, four months after the Royal Albert Bridge was opened.